Android TV is top of mind for pay-TV operators looking to stay competitive in this rapidly changing media landscape. It is highly attractive to operators for a number of reasons. In addition to being able to address a wide range of devices that consumers can access content on, the OTT ecosystem available through Google Play brings together thousands of apps that operators can instantly tie into. 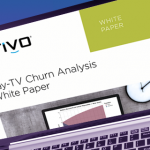 There are opportunities and challenges for pay-TV operators looking to incorporate Android TV into their portfolio strategy. TiVo is a trusted partner helping operators navigate this new world. © 2019 TiVo Corporation. All Rights Reserved. TiVo and the TiVo logo are registered trademarks of TiVo Corporation and its subsidiaries worldwide.